Welcome everyone, today sees us announce the winners for the January challenge 'Going round in Circles' but before we do have have a very special winning guest from back in November and that is the wonderful Cec Wintonyk. I am a retired Director of Finance and live with my wonderful husband of 41 years just outside Toronto, Canada. We have one daughter who is married and has blessed us with two fabulous grandchildren. I love jazz, reading crime mysteries, cooking, walking and travel. I have been crafting for as long as I can remember, have done many different ones over the years and still do some counted cross-stitch and some sewing. I started card making around 2006 but really just dabbled at it until 2009 when my job disappeared and then I had lots of time on my hands. 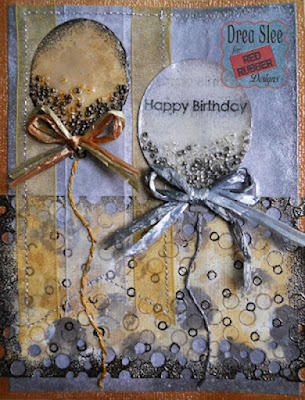 As time went on I started to make more vintage and shabby chic cards and was hooked. In the past couple of years I have added more mixed media to my repertoire. I have been blessed to be a member of some fabulous design teams over the years and show my creations on my blog, CW Card Creations. 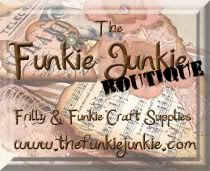 Thank you to the team here at A Vintage Journey for the opportunity to visit and share one of my creations. When I saw the theme that Jennie has set, Words That Are Special, a special word that came to mind was Change. I spent some time with the uber-talented and very lovely Jenny Marples a couple of months ago and she encouraged me to just play, which for me would involve change. Then I thought about a quote I heard at a conference a number of years ago about that very topic and I knew those would be my special words. This canvas came about by playing and trying not to over-think. I started with an 7"x9" canvas that I coated with Liquitex Gesso and then covered with crumpled up tissue paper. Next I added some random stenciling with Golden Light Molding Paste through a Dylusions stencil called Dotted Flowers. The next step was to add some paint and inks to the canvas and to a 3"x5" piece of wood (thick chipboard would work too). 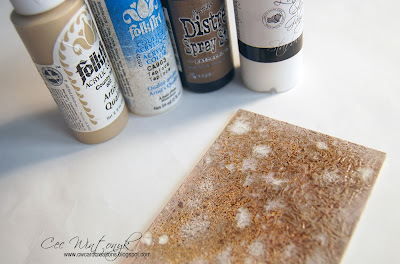 I started with a layer of Folk Art Country Twill acrylic paint and then spritzed on some Tim Holtz Gathered Twigs Distress Spray Stain and some Lindy's Frozen Jack Frost. I dry brushed some Folk Art Tapioca acrylic paint onto the wood panel to make it a bit lighter than the canvas. 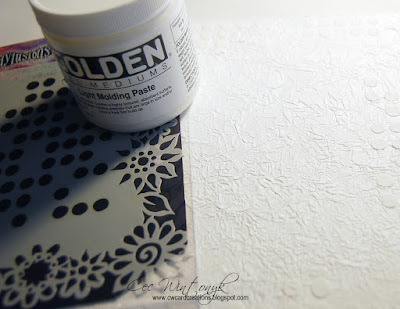 I also spritzed some Tim Holtz Tarnished Brass Distress Spray Stain on the canvas after the photos were taken. I hand cut a heart and used my fingers to dab on some of the Light Molding Paste. 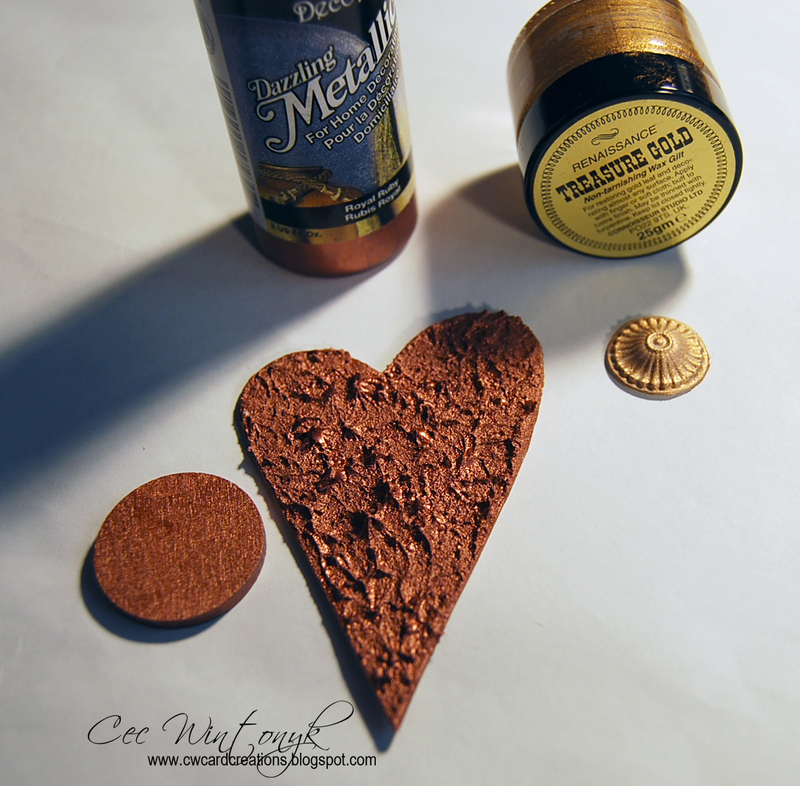 I painted the heart and a little circle of wood with some DecoArt Royal Ruby Metallic Acrylic paint . Then I made a little medallion from a Martha Stewart Crafter's Clay and mold that was covered in Classic Treasure Gold Wax Paste. 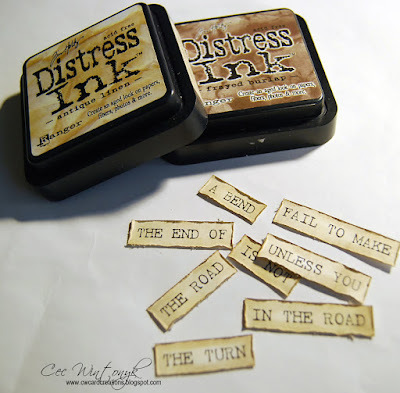 I used my computer to create the quote, cut each word out, distressed them and inked them with Tim Holtz Antique Linen and Frayed Burlap Distress Ink. To assemble the canvas, I added some gold wire to the heart, mounted it on the wood panel and then added the panel to the canvas. I painted some cream burlap with the Country Twill paint and added that along with some wire I stole from my husband's workshop. I tore the top off some corrugated cardboard, added some Tapioca paint and adhered it to the canvas. The medallion was mounted on top of the little circle and added to the corrugated strip. Finally I added my quote. Thanks again for the invitation to visit and to share my creation. The thanks are from us Cec for such a wonderful project to this months challenge line up for 'Words that are Special' and I love the sentiment of the words you have used. 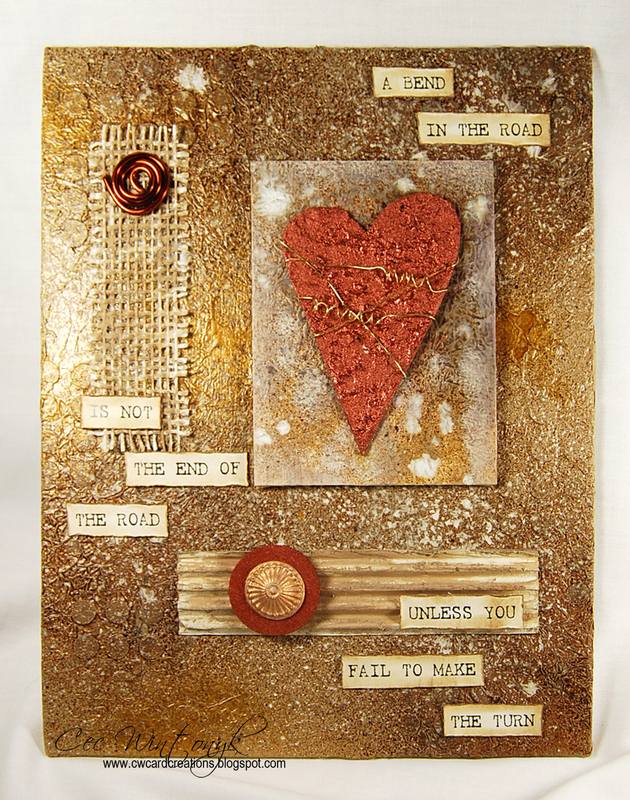 Your canvas is wonderfully textured and looks so special with the gold tones and the gorgeous heart panel. We are so pleased you could join us. Now to announce the winner and pinworthies for January's challenge. which is Zelda from Out of Africa Creations. 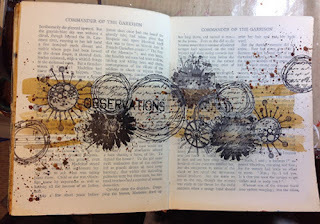 Zelda created this beautiful journal page using lots of circles, so it fitted the challenge theme perfectly. Thank you so much to all of you who entered I know everyone here had a ball looking through all the circle projects and giving me their favourites and we managed to whittle it down in the end. Your badges and invites to join us as a Guest Creative Guide will be wending their way to you soon and we look forward to you joining us on another challenge month. 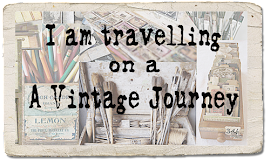 See you Monday for anther Destination Inspiration post and if you haven't managed to share a project with us yet for Jennie's Special Words challenge we would love to see you over there too. Wonderful work from Cec, thanks so much for sharing it with us here!! Love all those great textures and the colours are stunning too! Fabulous work from all of our other winners also, I am always amazed at the many different options in approaching a given theme. Congrats to you all ladies! Welcome Cec. Your canvas is gorgeous . A great quote that you've really made glow with all those golden tones. Thanks for sharing with us . Congratulations to our winner Zelda and our pinworthies - JulD, Drea and Hazel. Fab projects by all . What a pleasure it is to see Cec here as Guest Designer! 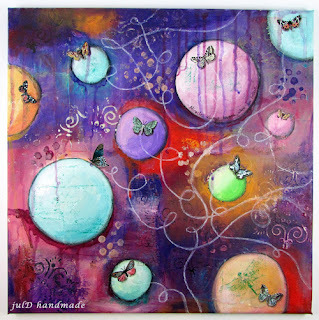 What a fabulous industrial canvas! I love all that texture, and your chosen words ring true! Congratulations to Zelda and the Pinworthies! Fabulous projects all around! High Five Cec! Your guest designer project is WONDERFUL. 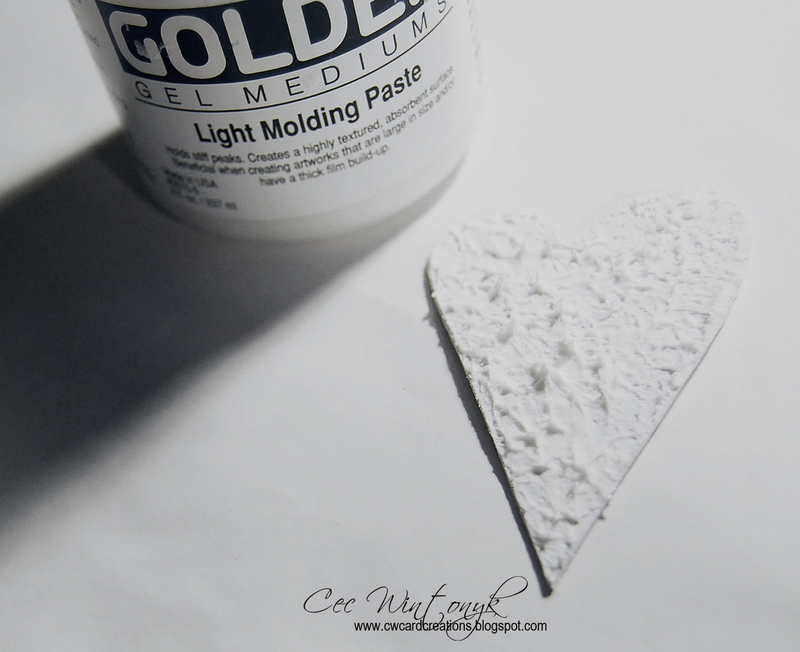 What a YUMMY heart in the beautiful DeceArt Dazzling Metallics! Loved reading more about you too. Congrats to the Jan. challenge winners and thank you AVJ for super inspiration. HAPPY VALENTINE'S Day! Xj. Cec, what a fantastic project! It's so fun to see you growing as an artist. What wonderful encouragement from Jenny and beautiful words of hope on your canvas for us all to admire. 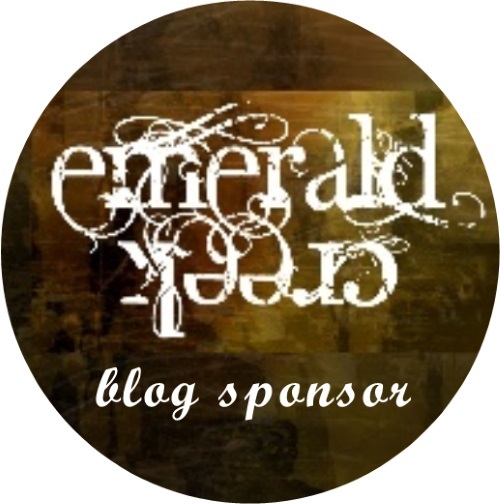 Wonderful guest post! And congratulations Zelda, Hazel, Drea and JulD! Oh my hat - can't believe my luck!! Thank you random org :) Congrats to the Pinworthies - such fabulous projects. Wonderful project Cec, love the words and all the texture! Fabulous, glamorous project from Cec and congratulations to the winner and all the Pinworthies. 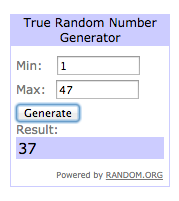 Thanks for choosing my card, and congrats to the winner and other Pinworthies! Awesome project Cec! Wonderful texture!